Dead Fall, Butler Co., AL, page 373A, based on LDS CD transcription: "Nathaniel B. Thomas [sic], Self, M, Md, 46, AL, SC, SC, Farmer; Helene, Wife, F, Md 44, AL, GA, GA; Stephen, Son, M, S, 23, AL, AL, AL; Abigail, Dau, F, S, 15, AL, AL, AL; Martha, Dau, F, S, 10, AL, AL, AL; Georgeann, Dau, F, S, W, 5, AL, AL, AL; Gelola, Dau, F, S, 2, AL, AL, AL." THAMES, Georgia R., wife of J.A. DAY; Mar. 12, 1875 - Oct. 29, 1902. E-mail written 2001 to Warren L. Culpepper from Elaine Pollock Culpepper. Find A Grave Memorial# 68971265. D. Elizabeth Page, 90, of Russellville died Wednesday, July 8, 2009 at Hearthstone Place in Elkton. Mrs. Page was born Dec. 9, 1918 in Lewisburg, a daughter of the late James Turner and Ora Ioma Porter. She was also preceded in death by her husband, Rev. John Lincoln Page, and a daughter, Beverly Pollack. She was a homemaker and member of Elk Lick Baptist Church and the Homemakers. Funeral services were Wednesday, July 15 at Elk Lick Baptist Church with Rev. Mark Baldauff and Rev. Art Hatfield officiating. Burial followed in Elk Lick Baptist Church Cemetery in Lewisburg. Price Funeral Home Inc. was in charge of the arrangements. Mrs. Page is survived by her daughters, Linda McIntosh of Olmstead, Rosemary Hall of New Port Richey, Fla., Paula Mellott of Franklin, and Sarah Brookshire of Granada Hills, Calif; her brother-in-law, Howard Danks of Lewisburg; her sisters-in-law, Octavia Smith of Lewisburg and Anna Rhuba Page of Russellville; eight grandchildren; and 16 great-grandchildren. Find A Grave Memorial# 39834387. Ancestry Unknown* � Information about the ancestry and siblings of Richard Strickland is wanted. See page footer for contact information. From Lew Griffin: "It would appear to me that the Richard Strickland in 1840 Lowndes County is a good a match for your 1850 Richard. The names Simeon and James Strickland also appear in 1840 Lowndes, and these were names your Richard used for sons. "A Simeon Strickland of Gwinnett County won land in the 1820 Land Lottery in Section 16 of Irwin, most of which ended up in Lowndes. He was probably the “Simpson” Strickland there in 1830. Martha Strickland, widow, of Tattnall, won land in Section 11 of Irwin, which also became Lowndes. And James Strickland, of Wilkinson, also won land in Section 11." Joel Strickland, 3, M, FL. Richard Strickland, 2M0-5, 1M20-29, 2F0-5, 1F20-29, 0 slaves. Joel S. Stricklin, 12, M, W, FL. R. Strickland, 1 M21-45, 1 M<21, 1 F21+, 3 Total. (WLC Note: It seems highly unlikely that all these grown children were actually living with their parents at this time). Santa Rosa County Clerk, compiler, Santa Rosa Co., FL Deed Index, Repository: LDS Family History Library - Salt Lake City, Call No. Film 929,763. Martha Strickland, GDau, F, S, W, 11, FL/GA/GA. E-mail written Dec 2005 to Warren L. Culpepper from Benjerman Allen Fennan, e-mail address. He was enumerated in the 1880 census, but in 1900 his wife Elizabeth is shown as a widow. Find A Grave Memorial# 29654494. The death certificate for Joel Simpson Strickland states that Joel's mother was Hettie Williams, born in Georgia. E-mail written 14 Jul 2012 to Warren L. Culpepper from D (gd/o #44510), e-mail address. Santa Rosa Co., FL, Ancestry.com image 18, transcribed by Warren Culpepper. Death Certificate for Joel Simpson Strickland. Died in Pensacola, Escambia Co., Florida after residing there for 30 years. He resided at 10th Avenue and 21st Street. Male, White, Widower. 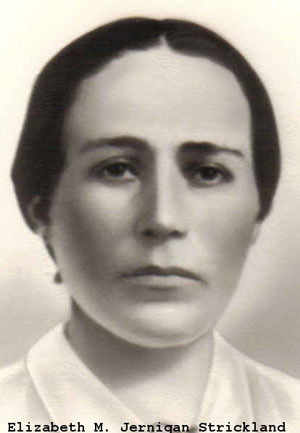 Born on 2 Sep 1844 in Georgia and died at 86 years, 5 months and 18 days. He had worked for 40 years as a timber inspector, but had not worked since 1905. He was the son of Richard Strickland and Hettie Williams, both of whom were born in Georgia. Informant for the preceding info was his daughter, Mrs. T. H. Douglas who lived at the same address as her father. He was buried in Milton Cemetery on 22 Jan 1931. Cause of death was undetermined, but probably due to cerebreal hemorrhage. Precinct 1, Santa Rosa Co., FL; page 179B, LDS CD. Strickland Cemetery, page 685; Edward C. Strickland, 29 Sep 1882 - 18 May 1970. Elizabeth Strickland, Step-Mo, May 1816, 84, Wd, GA/GA/GA, could not read or write. page 685. Buried next to J.S. Strickland, "Lollie Aymard Strickland, Feb 12, 1853 - Apr 2, 1929." page 685. No dates. "J. S. STRICKLAND / CO A 15 CONF CAV CSA." The Santa Rosa Co. FL Heritage Book Committee, The Heritage of Santa Rosa County, Florida, Clanton, AL: Heritage Publishing, 2003. Page 49: "Lollie Aymard Strickland, born 12 Feb 1853 in France... died 2 Apr 1929." Strickland Cemetery, page 685; Minnie Strickland Lewis 7 Oct 1875-21 Mar 1932. M. Strickland, Niece, Wh, F, 15, sng. Strickland Cemetery, page 686; Jasper A. Lewis, 9 Apr 1874 - 9 Apr 1952. Page 51, Jasper A. Lewis and Minnie L. Strickland, 14 Apr 1901. Page 47, Robert Robinso and Lottie M. Strickland, 4 Feb 1900. Indian Springs Precinct, Santa Rosa Co., FL, ED108, Page 208A, Genealogy.com image transcribed by Warren Culpepper. 16th Precinct, Bagdad, Santa Rosa Co., FL, ED108, Page 7 (211),. Page 52, Thomas H. Douglas and Lela Strickland, 4 Feb 1900. Strickland Cemetery, page 685; Lelia Douglas Bell, 4 Apr 1880 - 7 Jun 1953. Strickland Cemetery, page 685; Thomas H. Douglas, 22 Feb 1873 - 22 Jan 1937. Jane Otis, 40, F, W, Keeps House, AL [2nd wife]. Obituary* 16 Feb 1898� Mrs. Elizabeth Strickland died quite suddenly about half past six o'clock yesterday evening at her home, No. 321 South Union Street. She was apparently in good health, and had given no indication of sickness of any kind. She went out in the yard about half an hour before her death looking after some flowers, and on going into the house had a violent spasm of coughing. A physician was telephoned for, but the coughing was accompanied by a copious flow of blood which resulted in speedy death. It was supposed to be the breaking of a blood vessel. Mrs. Strickland was comparatively a stranger, having removed here from Flomaton about three months ago. She had three daughters, one of them the widow of the late Joseph Owen who was killed a few months ago in a railroad accident in Illinois. Mrs. Strickland was highly esteemed by her neighbors and friends whom she had made since moving here. Obituary of Elizabeth M. Jernigan from an unidentified newspaper. Malinda Otis, 1, F, FL.